This vacant store at 223 Second Ave. S.W. might be turned into shared office space. 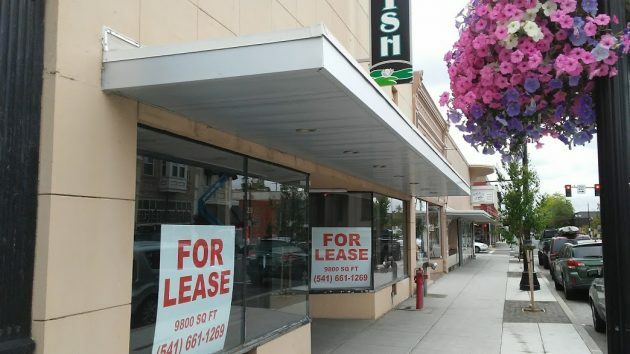 Whether anything comes of this is uncertain, but Albany’s downtown urban development board last week heard about an idea for turning a vacant store into shared office space and a couple of meeting rooms. What he has in mind is a place where small companies or start-ups could rent a desk. Utilities and support services like copiers would be included in the rent. Two meeting rooms in the back, holding up to 25 people each, could be used by the tenants or be made available to public agencies. If a tenant company expands, it wouldn’t have to move but could just rent another desk. A few members of the CARA board voiced support for the idea, or at least seemed intrigued. You can hear what they said by listening to the meeting here. Sure. If you can’t be successful in renting your business property in the open market – ask the Albany City Council to make your venture profitable by giving you some of the other peoples’ money they’ve been entrusted with. They have an established history of paying more than market – to the “right” people anyway. If they give you one of those “no repayment required” loans (who really doesn’t know the difference between a giveaway and a loan) – I hope the beneficiaries have remembered to record the gifts as income on their State & Federal Tax Returns – including the FMV of a below market interest rate. This is a great idea. I saw this in several cities both large and small in my recent travels to Michigan. One that I visited had a open waiting room when you walk inside and the walls displayed local artwork. The hallway had several offices with basic desks and chairs with some occupied on a regular basis and some that were furnished like they were. Lockers were available in the lunch room for part time tenants/business owners to house supplies for easy access when doing business. No receptionist. Everyone had their own key and the main door is only open whenever a tenant/tenants were holding office hours or appointments. Most recently, it was G2 Fun Zone. An indoor bounce house, mini golf and arcade, which is now located at the Heritage Mall. CARA is a self-described “lender of last resort”, meaning it provides public money to private businesses or individuals who don’t have, or can’t obtain, private funding from a private source. The profit-motivated private business/person claims they have no other alternative but to seek liquidity at the public trough. In effect, they demand that the public assume some of the risk for whatever project is being proposed. 1) What private sources of money turned you away? 2) Why did the private sources of money turn you away? 3) Is this the highest use of public money? When you’re the lender of last resort and dealing in public money, your first responsibility is to perform the highest degree of due diligence. In this regard, CARA has an abysmal record. #3 – The concept could be an excellent fit for CARA — subject the proposal that is brought forward down the road. Ray, 1 and 2 were discussed but not really addressed, the applicant could get a 5% loan, but thought that was too high. 5% is a low interest loan for small business. 8% is the norm. If he can not handle a 5% loan then he has no chance of being successful.. the most CARA should deal with here is help with the façade in the front on the outside.. So be specific – can he, or can’t he, get a loan from a private bank? If he can, CARA is no longer what they claim – a lender of last resort. CARA should not be in competition with local banks. Game over. Wallace is aiming to follow the WeWork business/real estate model, which seems to be a good one for landlords and tenants alike. Vince Barrett footnote: When the Barrett family home in east Albany was sold 15 or so years ago, I ended up with a pair of vintage 25-pound York dumbbells that had belonged to Vince, a champion handball player. Fun and useful souvenirs from an era in which a guy could make a living and provide a community service by owning an independent sporting goods store. Wasn’t this space most recently “G2 Fun Zone,” the Bounce House facility (now located at Heritage Mall)? I think it was. I had forgotten about this. Vince Barrett’s store was one door east of the building you are featuring in this article. It has an interesting brick façade on top and an angled door entrance. I believe it was recently an antique store. Many people living back in the 1950’s and 1960’s will remember buying their first Converse tennis shoes, Adidas, Jack Kramer tennis racquets, baseball mitts, golf clubs,athletic supporters, and more at this store. They also had a fine collection of dolls. Vince and his wife were two of the nicest merchants who ever opened up a storefront in Downtown Albany.. Correct me if I am wrong but this has been tried to a degree of success in our sister city, Corvallis with the MAC. Certainly worth trying in our dear downtown, no? Separate comment, why close the comment above with “no shade” having the last say? eh, HH? So damn tired of corporate interest. That’s an odd claim, HH. Didn’t you “trim” off the last sentence of my above comment? I edit comments, usually very lightly, sometimes more vigorously, like when something strikes me as worth cutting completely for any number of, to me, persuasive reasons. I live in Corvallis and had no idea of what the “MAC” is. A web search gave me all sorts of leads ranging from Apple computers to forest trails to hip hop, and something called the Madison Avenue Collective. A glance at their website and a further search gave me only a vague idea of what they do – “strategy,” “design,” “branding” – things which tend to be shrouded in obfuscation. “””The genesis for the ballot measure belongs to Jimerson, who runs the Madison Avenue Collective in Corvallis. I assume this is what you mean by “MAC,” although their operation seems more tightly focused than the Albany proposal. The misuse of acronyms is when the most important words of an article, etc, are abbreviated so that only a few insiders understand them, and everyone else is excluded. Sometimes it’s a juvenile attempt to look sophisticated. Usually it’s unintentional – something obvious to oneself should be obvious to everyone. Right? By the way, the lack of a “reply” link is a purely technical issue to keep comments from crawling too far to the right (no pun intended). Does anyone have pictures of the original facade as built in the 1890s?